Divine Compassion is upon all creation! Hanun v’rakhum Adonai, erekh apayim ugedal hased! Slow to anger and abundant in loving kindness! Het is related to “life” (Hayot) and “fear” (Hatat Elokim, Fear of G-d). In the Sefer Yetzirah, het is one of the twelve “simple letters,” and represents the activity of sight, the astrological sign of Cancer, the right hand in the human body, and the month of Tamuz in time. 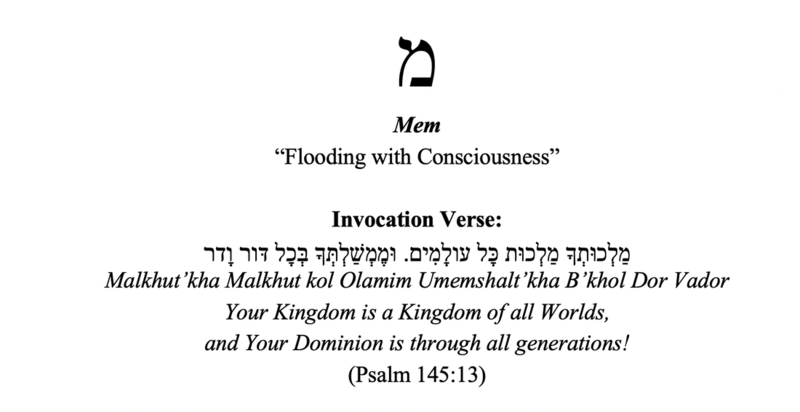 Het represents life – hayim, from Het – Yod – Heh. Hassidut teaches that there are two levels of life: “Essential Life” and “Life to Enliven.” In our present experience, we can know these two levels as the awareness behind all experience (Essential Life), and the awareness that takes the form of things we perceive (Life to Enliven). Distinguishing between these two levels is this particular Presence Portal. The middle ground is the process of “hovering.” This process is represented by the shape of the letter: Het is constructed of a vav and a zayin, with the thin line connecting them and pointing upward. The eagle, representing “hovering,” is the lining pointing up. The vav is including everything, the intimacy of coming close to whatever appears, while the zayin is the sword, staying hovered above, not attached to controlling anything. This aspect of non-attachment hints at the other meaning of Het, which is fear. In order to have the motivation to fully “cut the cord” so to speak, it’s helpful to have a bit of fear, in a sense, of the suffering that clinging produces. Chant the Het Invocation Verse with the meditation. Open meditation with the Ten Sefirot, adding Aleph, Bet, Gimel, Dalet, Hei, Vav Zayin and Het verses and visualizations. Visualize the Aleph above, the Bet below, the Gimel at your right, the Dalet at your left, Hei in your chest, Vav as your spine extending into your belly, Zayin as your right leg, and Het as your left leg as you chant the first six sefirot, then continue with the rest of the sefirot and the Sh’ma. And of Your fairness they will sing! Zayin can mean “sword,” and also “ornament.” In the Sefer Yetzirah, zayin is one of the twelve “simple letters,” and represents the activity motion, the astrological sign of Gemini, the left foot in the human body, and the month of Sivan in time. All my days have I have been raised among the sages, and I have not found anything better for the body than silence. Not study, but practice is the main thing, and those who multiply their words bring on error. The Zayin as sword is a metaphor for cutting away the ego’s drive to try to manipulate and control one’s experience, primarily manifesting as continuous thinking. This is a bit tricky, because the aggressive and violent connotation of the sword can be misleading. The key is not to try and cut away your thoughts or cut away your desires, but to cut the “cord” of your attachment to them; to “set them free” in a sense. You can do this simply by being aware of your desire to control or manipulate, deliberately disengage, and return to a state of allowing your experience to be as it is. The Zayin as ornament hints at Shabbat, the seventh day of the week which is an “ornament of time” in a sense. The practice of disengaging from work (malakha) is a practice conducive to the deep surrender that leads to dissolution of ego. There are three effects hinted at by the Mishna from Pirkei Avot: health of the body, authenticity of the personality, and wisdom of the mind – all are cultivated through the deliberate reduction of words and thinking, by “cutting away” or disengaging from our desire to control. In this way, we are free to be in the Reality of our actual experience. Our emotions and desires may still be there, but we are no longer trapped by them. Sit and watch thoughts and feelings carefully. Imagine a sword cutting them away as they come. The sword doesn’t kill them or push them away, it severs them from your will, so you simply behold them without any need to manipulate them. Then, when you have the feeling of this in your body, anchor it with the Zayin chant. Chant the Zayin Invocation Verse with the meditation. Open meditation with the Ten Sefirot, adding Aleph, Bet, Gimel, Dalet, Hei, Vav and Zayin verses and visualizations. Visualize the Aleph above, the Bet below, the Gimel at your right, the Dalet at your left, Hei in your chest, Vav as your spine extending into your belly, and Zayin as your right leg as you chant the first six sefirot, then continue with the rest of the sefirot and the Sh’ma.